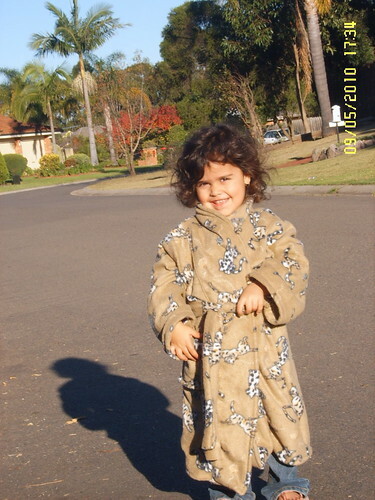 My second child, and second daughter, almost 3 years old, was in need of a warm bathrobe for the coming winter. Sydney, being what it is, has relatively mild winters compared to our Northern neighbours, with lovely warm days (average 17-18 degrees Celsius/ 65 degrees Farenheit), but out in the west especially, the nights and mornings can be pretty cold, often down to -1 degrees Celsius or lower, with frost. Not having central heating, nights and mornings can be hard, especially on kids. So warm nightgear is essential. I decided to get Jalie 2567 out of stash and to sew it up for my little girl. She will be 3 in July, but was big from birth (4.1kg), and continues to be stocky, so even though her height is 92cm, I made the 98cm, to allow for room to grow. It was my first time sewing with fleece entirely, and it was a bit fiddly. It was also my first Jalie pattern, and while I have heard great things about this company, and mostly agree, they are not Kwik Sew. I struggled with the instructions for sewing on the facings, but in the end, got there without any unpicking. My sewing skills must be improving, in spite of me! I traced, cut out, and sewed up this pattern in about 3 hours. 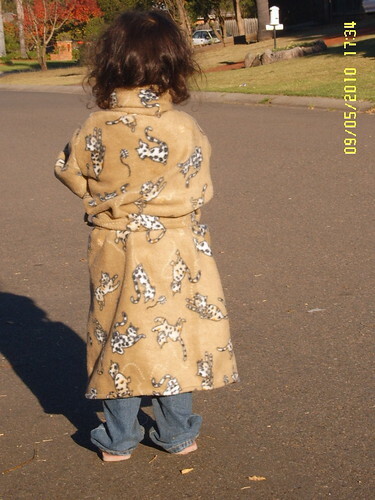 My husband was good enough to babysit, so that once I had the house chores done, and lunch made by 9am, I sewed. I must admit though, it was a bit like learning to do Caesarean Sections when I was first a trainee in 2004. After a while, the excitement wore off, and I just felt tired and just wanted to get it over and done with. Probably because it all still took mental effort, and was not ...on automatic. Still, here is the finished product. She was playing outside with her siblings, as the day was close to an end. The fabric isn't the nicest, print or otherwise. 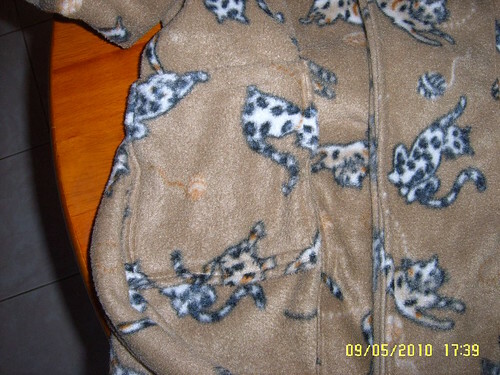 Clearance fleece from Spotlight about 2 years ago, brown, with cats on it. Still, it is functional enough and she loves it, so much so that she has gone to bed with it on tonight. It is large on her, I made a sizeG, which is for 98cm, for her 92cm frame, but I figured, it'd be great if it lasts her 2 years! (I love Jalie for this BTW. 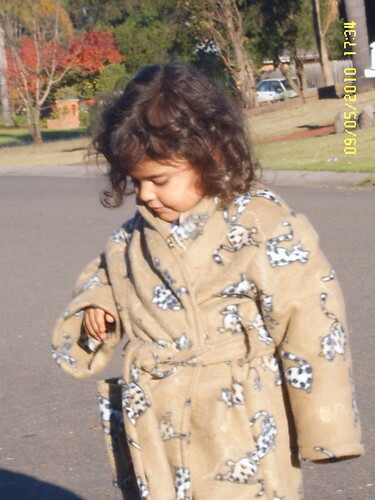 Now I have a robe pattern for the kids that I can use and use and use...27 sizes!!!). The sleeves are waaaaay too big, but I don't really think it matters, it's not like she will be eating in this. Mainly for use after baths, before/at bed, and in the mornings, so...she'll deal with it! 4. sewing a belt! Also a first. Great pattern, and completely worth the money, for the years and years and years of use that I will get out of this! Very cute and sweet on your daughter. I love your theme of 30 minutes too - it makes finding sewing time feel a bit more achievable.